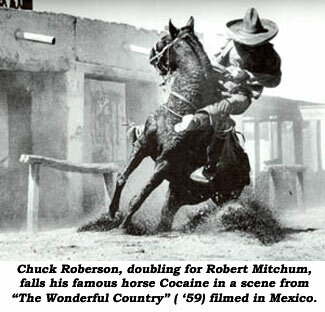 “Bad Chuck,” as he was known in the business, was one of the best horsemen the film industry has ever seen. He grew up on a cattle ranch in Texas and spent most of his waking hours on the back of a horse. Chuck and his younger brother, Lou, would share the back of an old horse they called Rusty, riding back and forth to school as there were no school buses in their part of Texas. Chuck got his first taste of breaking broncs when he was about 13 and he didn’t much like the idea of getting bucked off. The Great Depression was in full swing and Chuck’s Dad headed west where he thought things might be better. The family settled about 60 miles outside Roswell, NM, on the ranch of H.L. Price who took it upon himself to make Chuck a top notch cowboy. Price made a point of sticking the young bronc stomper on the meanest nags in his string. Chuck quit school when he was 13 and worked full time at being a cowboy. After six months under old man Price’s supervision Chuck was driving a four-up team. He was sent on cattle roundups with the hardened veterans of the ranch and did all the chores associated with ranch work. By 1940 Chuck had moved on and was, for a time, roughnecking in Texas oil fields. He soon married and had a daughter (Charlene, who became a makeup artist). Inspired by a cousin, Chuck packed up his new family and headed for Culver City, CA. He soon got a job as a policeman and after only two weeks of training was placed on duty at MGM. World War II hit and he joined the Army like so many other able bodied young men. Chuck was gone for three and a half years but after the war, went right back to the police department. On duty at Warner Bros. while a strike was going on, Chuck met and talked to Fred Kennedy, already a veteran movie stuntman. As they got to talking about horses, Fred encouraged Chuck to try his hand in films. They were making tons of cowboy films and he figured Chuck’s knowledge of horses would help him in the western stunt field. Fred sent Chuck over to Republic where he’d heard they were looking for big stuntmen. At 6'4", Chuck surely would fit the bill. 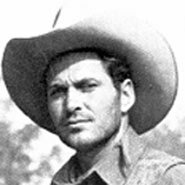 In 1946 Chuck was tested on horseback by the studio wrangler and immediately hired to double John Carroll in “Wyoming” starring Bill Elliott. Another young, upcoming stuntman, Ben Johnson, was doubling for Elliott. He helped Chuck immensely while on location at Kernville. In 1949, working as a bit player on John Wayne’s “Fighting Kentuckian”, Chuck had a chance to double for Wayne, already the biggest star on the Republic lot. A tricky mount Chuck performed so impressed Duke that Chuck became Wayne’s double for the next 30 years, traveling all over the world with the star and becoming one of his closest friends. When Chuck was making a rep as a top stuntman, most leading men were tall and Chuck soon found himself in demand to double for such stars as Gregory Peck, Burt Lancaster, Clark Gable, Robert Mitchum and Charlton Heston. Chuck kept working through a lot of the ‘70s but slowed down as his health started to deteriorate, writing his autobiography, THE FALL GUY, in 1980. He, sadly, succumbed to cancer June 8, 1988, at 69. At the time of his death he was raising horses on his ranch in Bakersfield, CA. 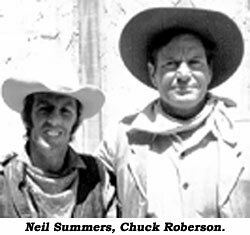 I first met Chuck on location in Nogales, AZ, doing “McLintock”. He knew from talking to me I took the movie business very seriously and my dream was to become a respected stuntman like him. Chuck always listened to me, advised me, guided me and saw to it I got placed in scenes where I could be noticed. He helped me and a lot of others up the ladder of success and for that I’ll always be grateful to him. I met Chuck on “Tripoli” in 1950 and we were fast friends from then on. He had the greatest falling horse I’ve ever seen, Cocaine, who he got unfinished from horse trainer Frosty Royce. Chuck really trained him well. (Cocaine was first used in “Last Outpost”.—ed.) Cocaine was never hurt in all the time Chuck had him. He died at 32. After Chuck’s back got so bad he had to retire, he raised racehorses, bought a couple acres across from Dixie Downs racetrack in St. George, Utah, and took his horses up there from his breeding ranch in Bakersfield to train them. When he’d get a couple of good ones he’d take them to Pleasanton in Northern California to race them at Golden Gate Field. He did very well. He had a way with horses I’ve never seen before. He instinctively knew when to walk ‘em, when to run ‘em...he’d know which race to enter them in...he was amazing. I made a lot of money betting on his horses. Chuck was one of the great stuntmen. There were guys better on their feet, but not on a horse. We did several pictures together and he taught me a lot. We were complete opposites, I was a city boy but I loved being around the stunt guys. On location at night he loved to play poker. Once, when he was playing with Rudd Weatherwax, who owned Lassie...they were all drinking pretty good and had gotten pretty crocked...and Chuck won Lassie! Of course, he gave Lassie back when they sobered up. Chuck and I bought and sold a lot of property together and we never had a contract, just trust. He was a very trustworthy guy.